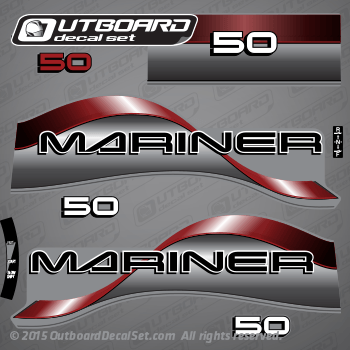 Mariner outboard decal set replica made on red for 50 hp Mariner Outboards from 1996-1997. Fresh decals printed today, not old stocks stored on the shelf for years about to expire. 1050302SD, 1050312SD, 1050312SR, 1050411SD, 1050412SD, 1055207SD, 1055207SR, 1055217SD, 1055217SR, 1055227SD, 1055227SR, 1060217SD, 1060227SD, 1060302SD, 1060312SD, 1060312SR, 1060411SD, 1060412SD, 1060412SN, 1060412ST, 1060452SD, 7050302ED, 7050312ED, 7050411ED, 7050412ED, 7055207ED, 7055217ED, 7055227ED, 7055227ER, 7060217ED, 7060227ED, 7060302ED, 7060312ED, 7060312ER, 7060411ED, 7060412ED, 7060412ET, 7060452ED. 10503027D, 1050302TD, 10503127D, 1050312TD, 10504117D, 1050411TD, 10504127D, 1050412TD, 1050412TE, 10552077D, 1055207TD, 10552177D, 1055217TD, 1055217TE, 10552277D, 1055227TD, 1055227TE, 10602177D, 1060217TD, 1060217TE, 10602277D, 1060227TD, 1060227TE, 10603027D, 1060302TD, 10603127D, 1060312TD, 10603527D, 1060352TD, 10603727D, 1060372TD, 10604117D, 10604117N, 1060411TD, 1060411TN, 10604127D, 10604127N, 1060412TD, 1060412TE, 1060412TN, 10604527D, 10604527N, 1060452TD, 1060452TN, 70503027B, 70503027D, 7050302FD, 70503127D, 70503127R, 7050312FD, 70504117D, 7050411FD, 70504127D, 7050412FD, 70552077D, 7055207FD, 70552177D, 70552177R, 7055217FD, 7055217FE, 7055217FR, 70552277D, 7055227FD, 7055227FE, 70602177D, 7060217FD, 7060217FE, 70602277D, 7060227FD, 70603027D, 7060302FD, 70603127D, 7060312FD, 70603727D, 7060372FD, 70604117D, 7060411FD, 70604127D, 7060412FD, 70604527D, 7060452FD. All other hp and Blue set version available upon request. this set with little variations may work on 45 jet, 50 hp, 55 hp and 60 hp covers.